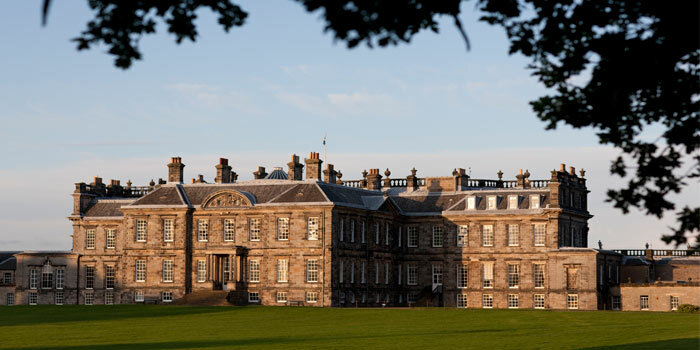 Hopetoun House and Estate has a great variety of locations suitable for television, film and photography, yet is within easy reach of Edinburgh and has excellent transport links. Hopetoun House sits in 150 acres of mature grounds with extensive lawn areas, deer parks, woodland, panoramic vistas over the Firth of Forth, outbuildings, period features, cobbled courtyards and lanes. The wider Estate spans a further 6,500 acres. The unique architecture of Hopetoun House provides a wide range of settings for any film or photography project. Because the house was built in two styles, it has two grand façades: the imposing Adam front facing East, and the more intimate Bruce façade facing West. Interiors include the grand State Apartments with ornate ceilings and period furniture, an oak panelled Parlour with French doors opening onto expansive lawns and fountain, a sweeping staircase with murals and cupola, and a grand ballroom. The rooms awaiting renovation provide a different opportunity for any media project requiring less opulent settings. Outwith the formal stately home and grounds there are a further 6,500 acres of magnificent countryside with drives, lanes, forest walks, farmland, woodland, coastal areas and historic buildings, monuments and ruins. There are also several shale bings which can provide an “otherworld” setting of deserted, inhospitable landscape. The Hopetoun team has extensive experience working with film, television and commercial companies, who have been delighted with Hopetoun as a location. Hopetoun has been the setting for a number of commercial and fashion photo shoots. The opulently decorated State Apartments provide the perfect backdrop for fashion photography, whilst the neutral design of the Adam Ballroom and Adam Stables accomodates a wide number of uses and themes. Add to this intricate architecture of the external façade, which offers many opportunities for a dramatic backdrop and you have the perfect location for every shot – all on one fantastic site. At Hopetoun we have a wealth of experience of hosting both large and smaller scale filming projects. We have previously hosted crews of over 150 for projects lasting 4 days or more. Our extensive grounds and estate provide the excellent base for filming within the local area. If you wish to enquire about Hopetoun as a media location, please contact us on 0131 331 2451 or enquiries@hopetoun.co.uk.